If you are looking for a place where you can spend a relaxing staycation in the heart of the Ozarks, stay at some of the best log cabins in Branson. The cabins at the Grand Mountain at Thousand Hills Golf Resort offer a lot of choices for your second home away from home. The beautiful ambiance of the place will let you experience a relaxing stay and a chance to enjoy the panoramic view of the beautiful natural scenery and wildlife at the foothills of the Ozark Mountain. Beautifully located in a secluded place and surrounded by nature but actually tucked into the heart of Branson, the log cabins at Grand Mountain offer both luxury and comfort. As you spend a relaxing staycation at the log cabin accommodations at the Grand Mountain at Thousand Hills Golf Resort, you are assured to enjoy the best of both worlds. These cozy log cabins in Branson feature elegant appointments such as tiled countertops, stone fireplaces, wood flooring, and Jacuzzi tubs that are sure to provide you great comfort. When you are through with great relaxation inside your comfy log cabin accommodation – entertainment, golf, shopping, and dining are just a short drive away. Since the inception of the log cabins in Branson, Thousand Hills believe that they provide the best log cabin experience that can easily be found and enjoyed around the Branson Missouri area. The staff and managers of Thousand Hills Golf Resort are hands on and have been dedicated to providing a luxury log cabin experience since the beginning, as their numerous awards and recommendations will attest. Many of their first time visitors are always wowed by what the repeat visitors have already known, the log cabins at Grand Mountain are the best choice by first time visitors. In this secluded area of central Branson, the luxurious log cabins of Thousand Hills Golf Resort are available in a variety of sizes. Some of the cabins feature a romantic intimate setting from one bedroom to the larger two to three bedroom cabins that can sleep up to eight guests. Most of these cabins feature a sofa sleeper to provide a comfortable stay for extra guest, living room, dining room, private porch and fully equipped kitchen. The log cabins at The Cabins Grand Mountain is dedicated to providing guests the rustic natural cabin experience while enjoying a luxurious and comfortable way of living yet affordable and accessible location tucked into the heart of the legendary Branson live entertainment district. The beautiful location of these log cabins in Branson is a perfect place to experience the beauty and magic of the Ozarks – either for a relaxing staycation or for a lifetime. Once you experience a relaxing vacation at the log cabins at Grand Mountain, you will know why more and more people want to come back again. 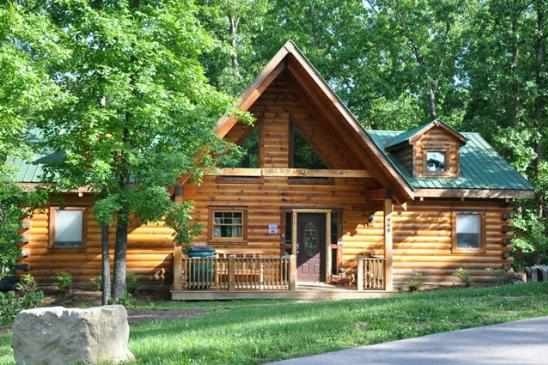 Log cabins in Branson are some of the best accommodations at Thousand Hills Golf Resort that can provide you a relaxing stay for your long spring vacation.